S&A Container Service rents roll-off rental dumpsters for all of Long Island (Nassau County and Suffolk County) and the five boroughs of NYC (Manhattan, Queens, The Bronx, Staten Island, and Brooklyn). Our competitive prices keep your costs low, and fast service means your dumpster rental will be delivered quickly, and picked up promptly when you’re finished or need another. Our expert knowledge of the right container for your space and excellent customer service make the entire process hassle-free. We offer dumpsters for rent from 6yd – 40yd dumpsters. S&A Container Service has you covered for any construction and demolition related debris along with recyclable material removal for projects of all sizes. Our dedicated customer support team ensures that any dumpster rental will meet your exact needs based on the project at hand. From the size of the debris removal project, to what general debris you’re disposing in the dumpster, to how long you’ll need it and how it will fit in your driveway or space, we’re here to help. Call S&A Container Service at 631-648-9088 for pricing or questions regarding dumpster rental for your upcoming construction and demolition debris and junk removal needs. Request a quote today. S&A Container Service has more than 180 roll-off dumpsters for rent at our Long Island facility, so we can provide you with quick and hassle-free pickup and delivery. Our standard practice is excellent customer service, which you’ll experience when working with us for your dumpster rental on Long Island or NYC. 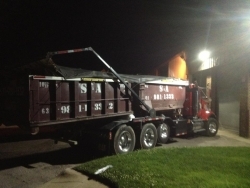 We can often provide next or even same day dumpster rental service. We’ll also provide you with plywood to protect your driveway, handle all the necessary permits for dumpster rentals on the street, and guide you through the process of selecting the right sized container for the most cost effective option. Call S&A Container Service today at 631-648-9088 or click here for a free estimate. Need to rent a dumpster for a day, week, month, or longer? We typically rent dumpsters for 7 to 10 days, but let us know if you need it picked up sooner or later so we can accommodate your needs.